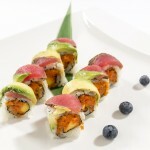 Crunch spicy tuna and mango inside topped with seared pepper tuna and avocado. Black rice available upon request. 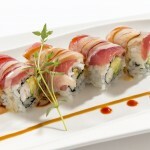 Spicy cooked shrimp, avocado, and tempura flakes inside, topped with tuna, yellowtail, spicy mayo, honey wasabi and eel sauce. 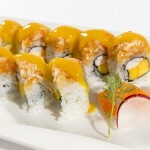 Cooked shrimp, mango and tempura flakes inside, topped with spicy king crab and mango sauce.